Like all HomePlug AV devices, the PlugLinks ship with 128 bit AES encryption enabled, using the same default key so you can just plug and play. They also both have buttons that can be used to set a different security code. Setting the code works like setting up a Wi-Fi WPS connection. You press the button on one device until a LED starts blinking. You then have two minutes to press the button on a second adapter to complete the setting. You can also usually change the security code using a utility program. Asoka includes one on a CD with the PoE adpater, but not with the Q1. But as noted earlier, you can download Asoka's PowerManager 1.89 utility. The screenshot below shows the Profile tab with the profile for the PoE version selected so that you can see the INT6000 MAC identified. The gallery below has screenshots of the other utility tabs. This utility is the only one I have seen that lets you set the link speeds to trigger the color change for the Powerline light. Its main negative is that is runs as a rather wide fixed-size window. This is the first utility seen that lets you adjust the link rate thresholds for the powerline LED color change. I tested the PoE paired with the Q1 at three locations in the SNB home using the standard powerline procedure. The uplink throughput averaged for all three test locations is charted for all 200 Mbps adpaters in the Powerline Charts database and shows the Asoka pair at the top. Average downlink results also show the Asoka adapters at the top of the chart. To see how throughput holds up over the three test locations, I generated uplink and downlink Performance Tables. I included one AV500 adapter (D-Link's DHP-501AV) and one other AV adpater (TRENDnet TPL-303E2K) for comparison. I threw in the AV500 adapter to show how this type of adapter's throughput declines more steeply than standard (200 Mbps) HomePlug AV. 500 Mbps powerline depends on accessing a higher frequencies to get that extra bandwidth, something not all home power wiring seems to accommodate very well. As you can see in Location E, the D-Link's throughput ends up around 10 Mbps lower than the Asoka's in both directions. 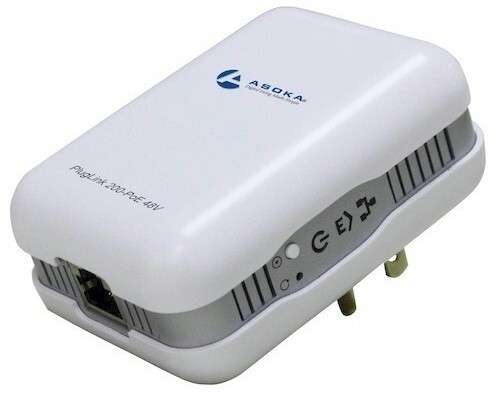 The Asoka is almost 20 Mbps higher than the TRENDnet's. In all, a pretty good showing. You can use the Powerline Charts to explore further. As a PoE functional check, I used the only PoE powered device I had handy, a Cisco WAP121. I plugged the PlugLink Q1 into an outlet in my office and connected it to my LAN switch. I brought the WAP121 up to my kitchen, er, Location E, plugged the PlugLink PoE into a wall outlet, then connected the WAP121 to the PlugLink with a CAT5 patch cable. The WAP121 powered up, linked up and was happily connected into my LAN. Easy peasy. I can see the PlugLink PoE being very convenient for deploying network cameras, IP phones and access points where there isn't an Ethernet drop handy, but there is an AC outlet. Sure, you could always plug in a wall-wart to power your device since there is AC power. But once the desired location of your device exceeds the length of its power adapter cord, the PlugLink PoE starts looking like a pretty good idea. For its intended use, I don't think the fact that it is 200 Mbps AV vs. 500 Mbps is that big a drawback. As the Performance Table comparison showed, the Asoka ended up providing more throughput than an AV500 device under not that extreme conditions. If all this sounds good to you, go hit Asoka's web store, since that's the only place you can buy the PlugLink PL9660-PoE, at least for now.